If you need to flush a toilet while the running water is off at home, here’s how to do it, and what to watch out for. I’ll explain how much you’ll need to flush and what to do with your toilet. Under temporary water outage conditions, you can easily flush your own toilet. You will still need water, but you don’t need running water from the pipes in your own house plumbing. – Is there a back yard swimming pool nearby? – Get in your car and drive to any water source. Submerge container and fill ‘er up. 2. Remove the toilet tank reservoir lid. If you have already flushed the toilet once since the running water stopped, the tank will be empty. 3. 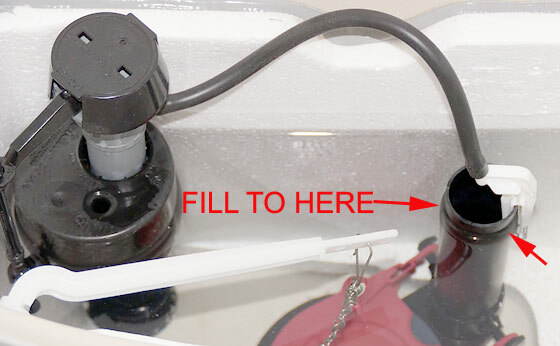 Using the spout on the water container, fill the toilet tank up until the water almost reaches the top of the overflow tube as shown. Note: Chances are that you won’t have to fill the toilet tank all the way to the top of the tube. Experiment with less – enough to ‘get the job done’ (e.g. try 2/3 the way up). 4. Then flush the toilet!. Note: Most modern efficient toilets only require about 1.5 or 2 gallons (or less) of water to flush the toilet effectively. Older toilets may require several gallons or more. For example, the container that I listed above (5.5 gallons) will get you between 2 and 4 flushes, depending on the toilet. Water Barrel Storage For Emergencies. Thank you for this idea. I place a bucket in the shower to collect the shower water as it’s warming up. I then use that to flush by directly pouring it into the toilet bowel. It usually takes less than a gallon, but it works better coming out of a bucket instead of a gallon container because you need the extra force of the water. It’s good practice for an emergency. I also use the rinse water when I wash dishes by hand. An even funnier idea is to use the rinse water from the washing machine which is quite a work out! 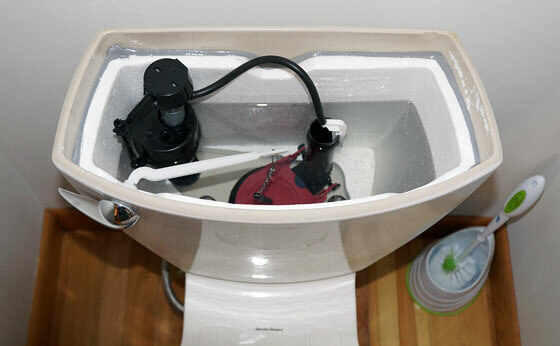 I have also used a small portable sump pump to drain bath water into the yard and water plants. My family is not very impressed with my water recycling practices and my friends think I am nutty, but it makes for good laughs. I am finding it is easier to teach people preparedness practices if you can share your ideas with laughter because they remember it better and it’s not as threatening. The Neighborhood watch actually got after me when I removed my lawns and “decorative trees” when I first moved in! They have no legal right by the way…. Great post. Many people do not know this. Also, many newer homes with septic systems still require electricity to work. Nearly all homes with a toilet in the basement, which is most of the newer ones around where I live. Most houses with sand filters too. Installing a back flow preventer valve in the sewer line will prevent a messy disaster. A simple flapper style can be had for about $40. Be mindful that if the sewer line in the street is filled to capacity, you can’t keep flushing. The valve will work fine but … you get the idea. Or get a plumber’s inflatable or (wing nut) expandable test plug. I had no idea such a thing existed! I was sonering what to do in case of emergency. Every time we lose power, we lose water because we have a well. We flush like “T in TX” by just pouring a small bucket of water directly into the bowl. No need to remove the top off of the tank to fill it. The force of the 1 gallon of water entering the bowl all at once actually works better than flushing. I agree. How many times have you had to flush more than once? Gallon of water poured gently in the bowl works better than a flush. Besides, dropping the reservoir lid can make it a bad day for everybody. Oh, crap! It’s a lot safer pouring the water into the tank. The tank contains clean water. The bowl does not. Getting splashed by ‘stuff’ from the bowl can ruin your day. We have no water from our well on a regular basis. For several different reasons; plumbing or electrical problems, a truck knocking down the power pole down the road, etc. I keep an ice cream bucket and several gallon jugs of water behind the toilet to use on these occasions. We pour the water directly into the bowl(from the bucket,not jug), with practice you can do it without splashing any yuckies on yourself, and it takes less water, a LOT less water. And if the power or water is off for more than a day, we only flush when there are solids. What if my tank is broken n can’t fill, can I pour water into toilet bowl to flush? just pour in a bucket of water. if it doesn’t “flush”, add another. IF you have a supply of strong trash bags, one can be prepared, put in the bowl with the extra height rolled down and adjusted to the requirements. Then disposed of or stored in a suitable place, and replace in toilet. Its better than nothing I’m told. My water is off due to landlord not paying sewage. I have to use the toilet with no water. I buy water to flush feces only. Is this harming the sewer? Will it back up in my house? What can I do. He hasn’t paid the bill. It won’t hurt the sewer but I would contact your city first thing Monday and see if they can tell you who you really need to get in touch with. Probably a county health office – landlord HAS to provide or you will not be allowed to stay.